In a wide bowl, add the rice flour and gram flour . Add in the redchilli powder, salt, sesame seeds,butter and asafoetida. Mix this into a soft dough using water. Heat oil for deep frying in a kadai. Add a portion of dough in the murukku press (use the ribbon pakoda achu) and make a round layer in hot oil. When it is done on one side flip this carefully using the ladle. When the sizzling sound subsides take it out from the hot oil and drain the excess oil in a kitchen towel. Repeat this for the remaining dough. Store this in airtight container. Always fry the pakoda in hot oil. If you make the make the flame low the pakodas will drink lot of oil. Always use fine quality and smooth flour. If the flour is not of fine texture the pakoda will break when we make and also it will drink oil. If making in bulk, just mix all the ingredients except water. Make dough in batches to avoid the pakodas getting reddish in colur. Fresh ground pepper powder can be used instead of red chilli powder. perfect n crispy ribbon pakoda....nice presentation n click jeya! Love them very much,feel like munching some. Wow! Lovely..Amma makes it at home and I cannot resist munching on them till they finish. Very very crisp & yummy......will have to try. So crispy and crunchy !! perfectly done !! One of my fav snack...Looks crispy & yummmm!!!! But aren`t they a bit difficult to press?? Mom always says who & ends up not making some part of the dough mixed..! 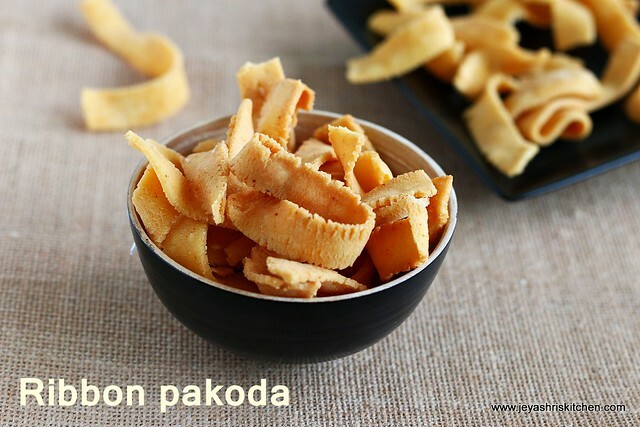 Perfect and crispy ribbon pakoda,luks gr8! @prathima: i never experienced any difficulty in pressing this.If the dough is of right soft consistency, then it will be very easy to press.If this is too loose, then it will consume more oil and may break. It is all time favorite and a must for Diwali. Very crisp. wow..crisp fried with a hot cup of tea..Perfectly made!!! Looks absolutely yumm and perfect. This snack looks so delicious and crispy. Wonderful preparation. wow, thats looking crispy and mouthwatering !! Ribbon pakodas look awesome! And excellent clicks! 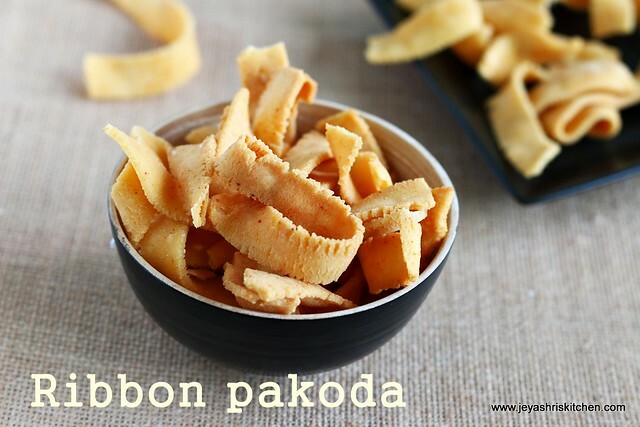 I love ribbon pakoda.. i like all the savoury items more than the sweet ones actually. Love the pics! Looks very crisp and clear pictures. its been so long I had these pakoda, look so perfect n crispy..
Yumm and crunch Ribbon Pakora recipes Dear.Luv it. 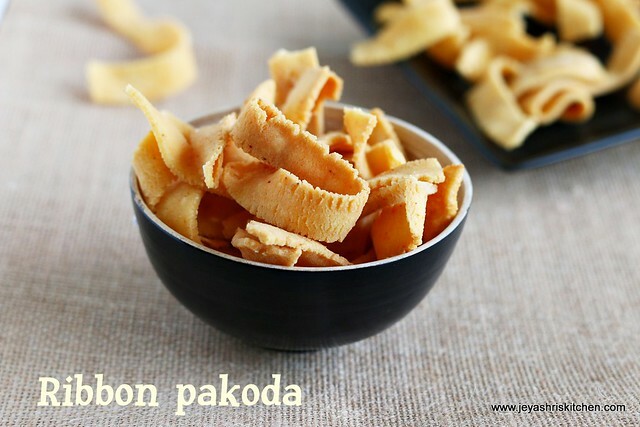 we are all very fond of ribbon pakoda and its indeed easy to make too..lovely presentation. One my fav among the snacks.crispy and tasty one.Nicely done. Crispy and yummy ribbons. Happy Diwali to you and your family. your preparations are always o neat and perfect. he ribbon pakoras can give any snack shop a run for their money. Yes you can use store bought Rice flour. just followed this recipe word to word and it turned out very crispy and tasty. Thanks for sharing a wonderful recipe. Lovely! Any tip/suggestion to avoid sogginess and ensure crispness? Perfect measurements and tips! I have tried many times but it was never this good! This is the first time I tried making a snack. It came out very tasty and crispy, a bit dark in color though. Thank you for the clear instructions :) Happy Diwali..!! Hi, thanks for trying. The reason for the hardness is the dough must be too thick or the oil or butter which we add to the dough must be added less, than mentioned. My nadas are not coming flat.I am using the same mould which you are using.but the murukku is crispy and taste is also gud. The reason may be because of the colour of the red chili powder and may be slightly over cooked. Hi.. I tried this today it came out really well.. thank u for the recipe..